If you’ve read a few of our posts you know that we travel and do many adventures with our children. How many of you think that traveling with kids is tough? We slow travel this globe with a 3 & 1 year old and can definitively say that traveling with children is not hard. But, let me start with why I’m writing this post. 5. Strollers are as much a bane as a boon. These rules make it seem that traveling with children is about shutting them up, wearing them out and distracting them from the act of travel. As a traveling family, we can’t stand to hear such terrible advice because we feel that introducing­ kids to the world around them is one of the best gifts they can receive and we can give. How about giving kids a chance for discovery and adventure..isn’t that why we, as adults, travel? Here’s the Truth: Travel isn’t tough, but Parenting is. Traveling with children is not tough. Being a parent is tough. Parenting can be the biggest frustration and the biggest celebration, all within the same hour. Parenting doesn’t stop when you travel with a child. Actually, children travel exceedingly well, but sometimes their parents don’t. Do not fault the children for being children, it is the parent who needs to adjust to make the travel fun for all. 1. Time: Have plenty of it. Air travel is stressful enough without the added stress of a time crunch. Traveling with children will slow your pace and airports are surprisingly fun for them. We try to get to the airport, bus station or water taxi early so that we aren’t constantly pushing our kids to go faster, telling them to hurry up and ruining the travel experience. Time is not endless and eventually you will have to move them along, but if they’ve had a chance to explore this should be easier, but it’s not always. 2. Food: Don’t cripple your child by not letting them try new foods. One of my pet peeves is when a mom says “oh, she probably won’t like that” in front of their child, it’s a way of priming the child NOT to like the food and creating expectations to not like it. Give your child a chance…they may surprise you. And if they don’t like it…don’t say “I knew it! She doesn’t like most food”…again, your expecting them to not like different food and they will rise to those expectations. If all your kid eats is french fries and chicken nuggets, that is your fault not your kid’s. 3. Flexibility – learn to adapt with changes in schedule, yours and the kids. Explain to your child the plan for the day so they have some sense of what you are going to do today, but remain flexible and ask them what they’d like to do. Having the skill to be flexible and adaptable is one of the biggest predictors of success. Kids learn to be flexible by watching their parents handle new unpredicted situations. Also, as parents, you and your spouse may not always get to do things together. One may have to stay with the kids while the other enjoys an activity. 4. Travel Light! On our most recent Backpacking trip with the kids, we had one backpack that held all of our stuff and one small daypack for water, snacks and diapers. And no stroller, we would either carry the kids or, most of the time, they loved to walk. Travel light…it will give you so much more freedom, saves you time unpacking, repacking and finding things and makes carrying your luggage or backpack less of a chore. Kids don’t need a load of toys to keep them busy. Sometimes, an iPad or a small toy can help on a long airplane or bus ride, but we usually don’t end up having to use it. The world is their toy, finding things to play with along the way and making up games is all part of travel, and makes for a lighter backpack. 5. Slow your pace of travel: Traveling with small children will slow down the pace of travel, that comes from a natural tendency for children to completely disregard time. They are so fortunate in that regard. If they are enjoying something, they want to keep enjoying it. Who wouldn’t? Let the kids play while you enjoy a great local coffee or seaweed shake. A change of pace can be positive if you embrace it. Children are natural explorers and if their love of learning and exploration hasn’t already been squashed, they will find new situations to be fascinating. You may feel like rushing through an airport terminal, but to them it is a new, amazing world. You can’t rush curiosity and it should be allowed to unravel. 6. Snacks: have a few snacks in your backpack or purse ready for your kids. We prefer carrot & celery sticks over bagged stuff, but sometimes bagged stuff is all we have. A hungry child is a cranky child is a stressed adult. Snacks will help occupy time and feed the belly. 7. Patience, and loads of it. In short, all children really need on trips are fun activities, exercise for their growing wiggly bodies, and a sense of knowledge about where they are going and some power over what they can do when they get there. Take your children to different places in the world, it is an amazing adventure. And do not worry if they are young and won’t remember most of the details, a child’s experience at a young age is what shapes their personalities for life. Yes, sometimes we want a break from our kids. Traveling with kids is not always pleasant, but neither is parenting or life in general. Get out with your children, have fun and play together! Expose them to new foods, encourage their curiosity to explore new places, and most importantly… teach them to adjust!! Kids are adaptable and imitate what they see. You, as the parent, can be an incredible, adaptable example. Your own flexibility and response to new situations helps your child in the future, as well as yourself. 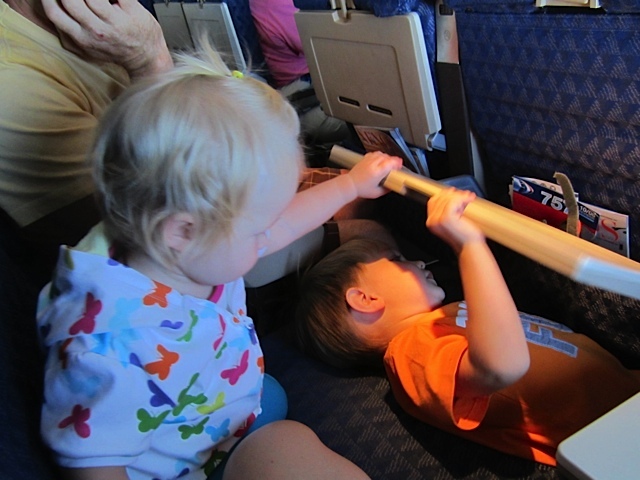 The reality of an airplane: it's a really fun discovery zone. What are your tips for traveling with children?